It has been a stressful few days and in the good old days I would have reached for my trusty pipe and tobacco pouch. Others would have reached for cigarette packets or cigar cases or snuff boxes : whatever the delivery method, tobacco was the preferred accompaniment to lifes' ups and downs. Now we know better and tobacco sales are hidden away behind high counters, plain wrappers and dire warnings. 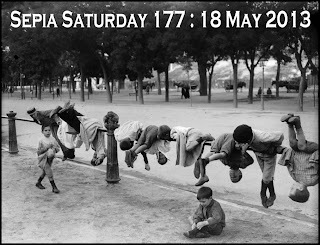 But here on Sepia Saturday we deal with the past, and therefore Sepia Saturday 175 - post your posts on or around Saturday 4th May 2013 - provides you with an opportunity to light up your blog with pictures featuring smoking, cigarettes, vending machines, gold flakes, black cats ... or anything else you can spot in our archive image. The picture dates back to 1931 and features a rather unique device - a vending machine that delivered a lit cigarette! The picture comes from the Flickr Commons stream of the Dutch National Archive. 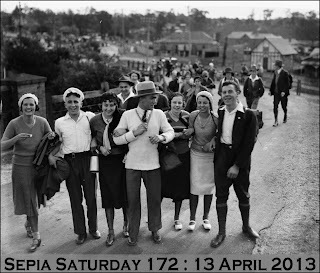 Before you rush off to post your post, you may want to relax for a few moments, take a pinch of snuff, and consider what the next two Sepia Saturdays have to offer. 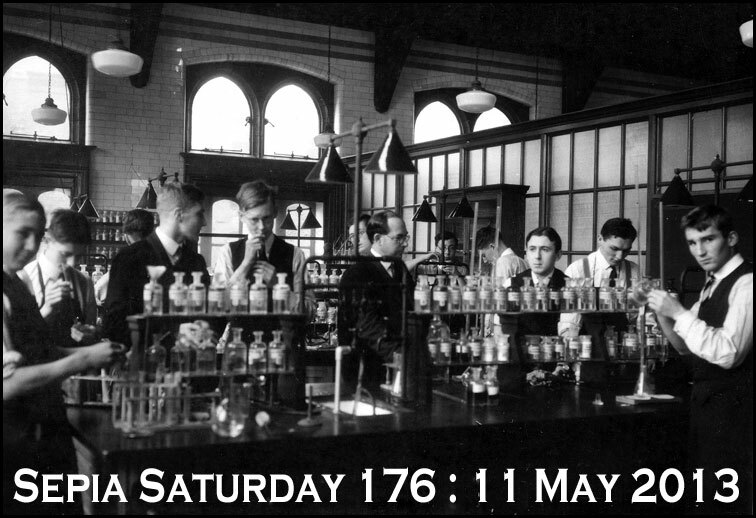 176 : A chemistry lesson takes us back to school for SS176. Schools were such important parts of all our lives and our collections are bound to feature some school-related photographs. Our theme image is bound to get a reaction! 177 : Sepia Saturday 177 stays with kids, but these kids are upside down, wrong way around and all over the place. Kids have always climbed and swung and proud parents have always taken photographs of their acrobatic endeavours. But kids are for the future and this week we are staying with our smoking theme. Just post your posts and then link them to the Linky List below. WARNING FROM THE SURGEON-GENERAL : Smoking can seriously damage your health whereas posting old photographs of people smoking will not damage your computer at all. As more and more people get their news from on-line sources, you could be forgiven for thinking that the days of the traditional newspaper are numbered. But go back just a few decades and those over-sized, finger-inking, arm-aching beasts were the way that we all found out what was happening in the world at large. My archive image this week dates from July 1969 and shows a group of avid newspaper readers. It comes from the Flickr Commons photostream of the Netherlands' Nationaal Archief. 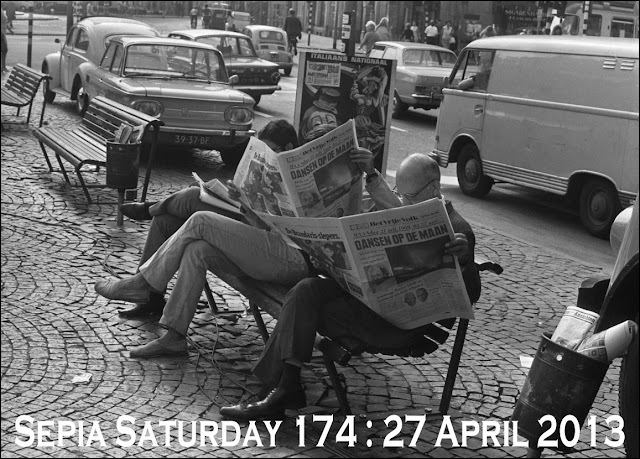 If you are theme-following this week you might care to go with newspapers or readers or benches; or you might want to focus on the specific event that was causing all that interest 44 years ago (is it really that long ago!). Wherever you choose to go, post your posts on or around Saturday 27 April 2013 and link them to the list below. 175 : I know we frown upon smoking now, but earlier generations were frequently photographed with a cigarette in their hands or mouths. 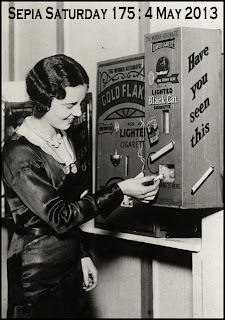 If you have no smoking ancestors, there is always vending machines, golden flakes and black cats. Just back from my week away and I am feeling a little odd. It has nothing to do with the food (which was quite splendid) nor the drink (which was pleasantly plentiful), I just feel like something a little odd. 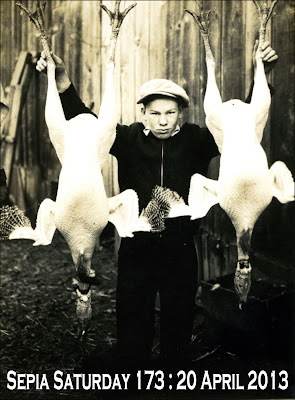 Take this photograph entitled "Boy with Birds, Goshen, Oregon" (from the Oregon State University Collection on Flickr Commons) - you have to admit that it is a bit odd. But we all have odd photographs in our collections and this week is there special week. 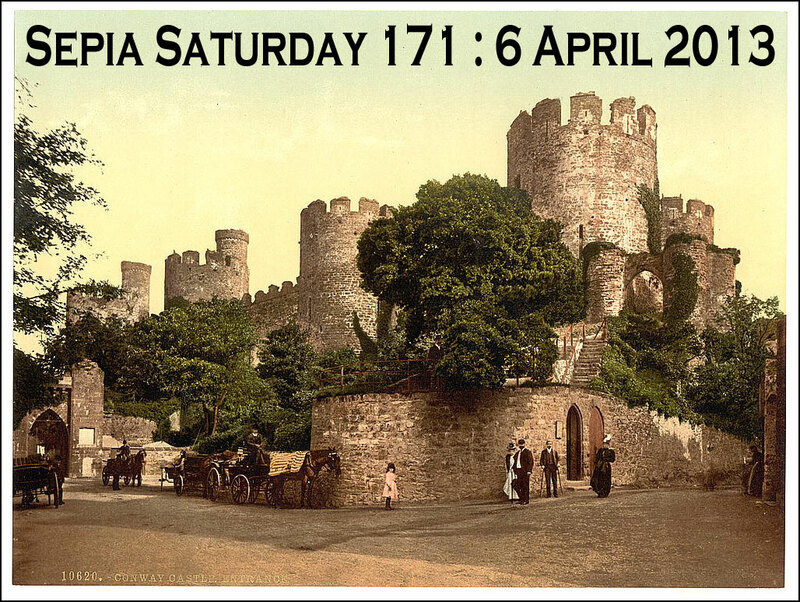 Just find an odd photograph, put together an odd post, and post it on or about Saturday 20 April 2013. Then just add your link to the list below and join together with all the other odd Sepians from throughout the world. 174 : There are a number of easy theme possibilities here - newspapers, people sitting down - but those Sepians who like a challenge might like to get behind the headlines. But back to the odd now. What strange images are hidden away in the dark corners of your shoebox of photographs. Time to expose them to the light of day. The Day Of The Odd is upon us. It is time to get out your knapsack, pull on your long woolly socks, dig out your sensible shoes, staple a smile to your face, and head for the open road. This week on Sepia Saturday we are off hiking and whether you know where you are going or, like those in this archive photo entitled "Palmer's Mystery Hike No. 2", the destination is not as important as the journey, there is fun to be had. As for those who are in search of a theme, there are walkers, roads, hats, short trousers, and the alarming phenomenon of a woman with three legs. In the great traditions of Sepia Saturday, it doesn't matter what theme you follow, it is the day out which is the enjoyable thing. So plan your days out on or around Saturday 13th April 2013 and add a link to the list below. 173 : Now this particular photograph is just plain odd. What on earth is going on here I can't begin to imagine. But we all have odd old photographs in our collections and here is your chance to feature them. Well, there we are. My call post is up extra early this week as I am about to head off to Spain for a few days. I am sure that whilst I am there I will be thinking of you all in your walking boots, enjoying the robust Spring (Autumn for those antipodean Sepians) weather as you scale some craggy peak. I, meanwhile, will be sat in some bar soaking up the sun and alcohol in equal measures. Salud! This year is the centenary of the introduction in Britain of the 1913 Ancient Monuments Act which recognised for the first time that the state had a duty to ensure the continued survival of certain key physical and historical remains. Pointing this out to me, stalwart Sepian, Marilyn Brindley, suggested that it was time for an old ruin (could she have been referring to me) or at least time for a castle. And so our theme image features an old photograph of Conway Castle in Wales which forms part of the collection of the Library of Congress which is available via Flickr Commons. You could perhaps feature a castle or a monument or a ruin or ... well the choice is yours. 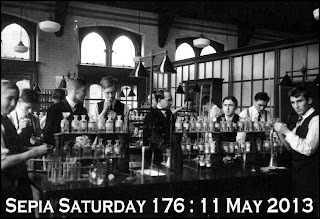 Just give us an old image and a few words of explanation and post your post on or around Saturday 6th April 2013 and then link your post using the Linky List below. Before we cross the drawbridge and enter the castle keep, let us have a look at what lies ahead for Sepians during April. But for now, take your place on the battlements, it's time to pay tribute to all that is grand, all that is old and all that is ruined. As for me, in the words of the singer Meatloaf, "two out of three ain't bad".